The landscape in winter is fairly subdued when compared with the rush of spring, summer and fall color, but don't be too quick to dismiss the garden in the off season. 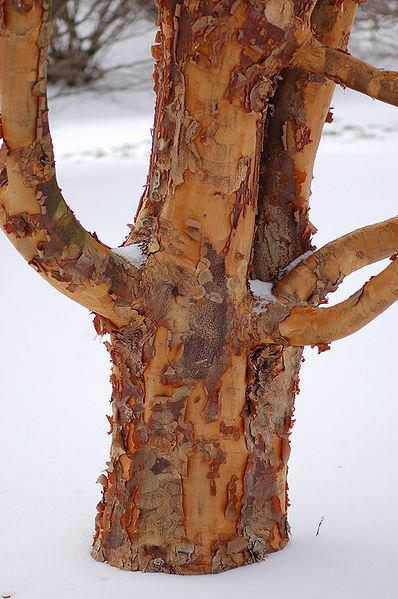 Evergreens are obvious choices for winter interest, but there are a lot of deciduous trees that offer interesting bark, brightly colored berries, and interesting form. Below are a few possibilities that not only offer interest during the winter months, but also throughout the year. Other than the five trees listed you may want to consider the following: Sycamore, Beech, Harry Lauders Walking Stick, Parrotia, River Birch, Shingle Oak and Lacebark Elm. Rhus tolerates unfavorable conditions, thrives in polluted city air, and grows in such inhospitable sites as cracks in pavement. It will grow on any soil type. Staghorn sumac establishes on clearings, hillsides, open woods, and disturbed areas such as roadsides and reduced-tillage fields. Often dismissed as a weed tree because of it's pioneering ways; the Staghorn looks great in groves towards edges and inbetween areas. 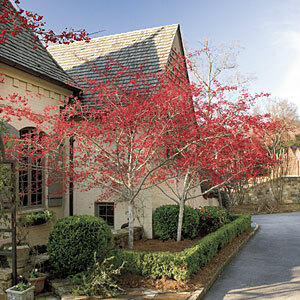 Great fall color, strong structural character year around, and dramatic 'staghorn' seedheads in fall and winter. 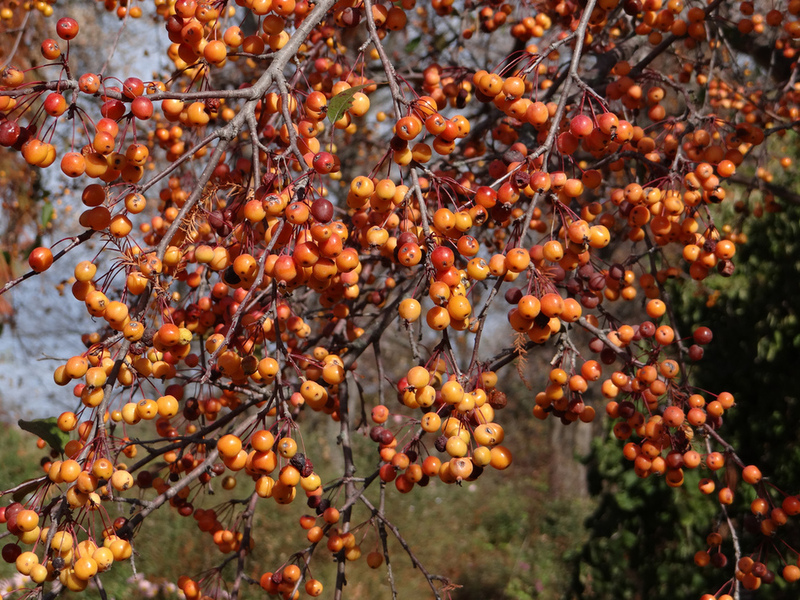 Red berries that persist through the winter' if they are not taken by birds, and exfoliating cinnamon colored bark give this tree great winter character. The berries are outstanding on a snowy day with an evergreen backdrop. The 'Winter King' smothers itself with white flowers in spring. In the landscape the tree can be used as a specimen, in loose groves or as an allee. Zones 4-7. Peeling bark takes several different forms, and Stewartia has one of the more unique appearances. As older bark flakes off, a gray, brown and pale red patchwork effect appears on the trunk of the tree, creating an interesting contrast to snowy landscapes. Zones 5-9. 4. ‘Harvest Gold’ Crabapple and 'Indian Magic' Crabapple. 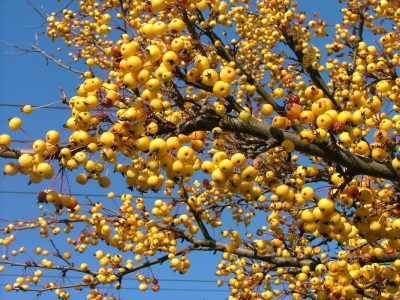 Brightly colored berries are carried by the branches if these two crabapples. The 'Harvest Gold' has yellow berries and the 'Indian Magic' has orange fruit. Zones 4-8. In the large family of maples, the Paperbark is fairly small growing from 15 - 25'. 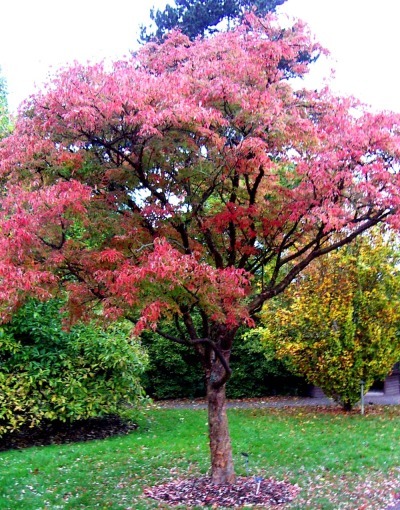 Characteristically upright with an oval outline, the tree offers outstanding red fall color, and a cinnamon colored bark that exfoliates as the tree ages. Zones 4-8.